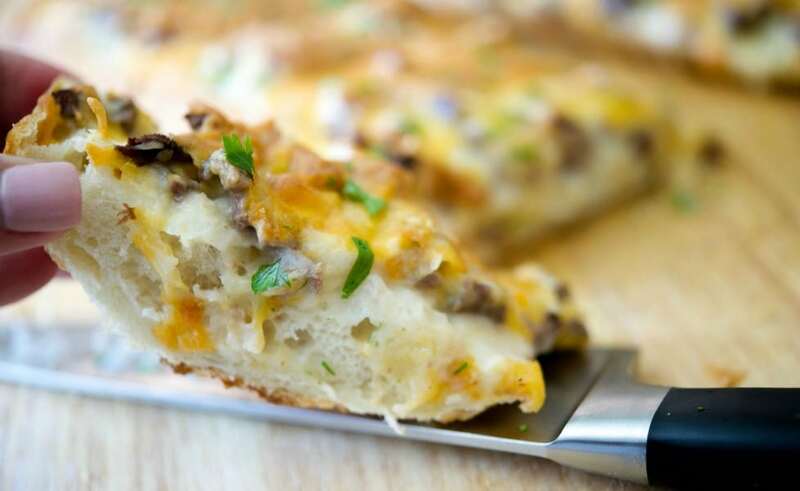 This Steak & Cheddar French Bread Pizza made with leftover grilled steak, shredded Cheddar Jack cheese and a horseradish cream sauce is sure to please. 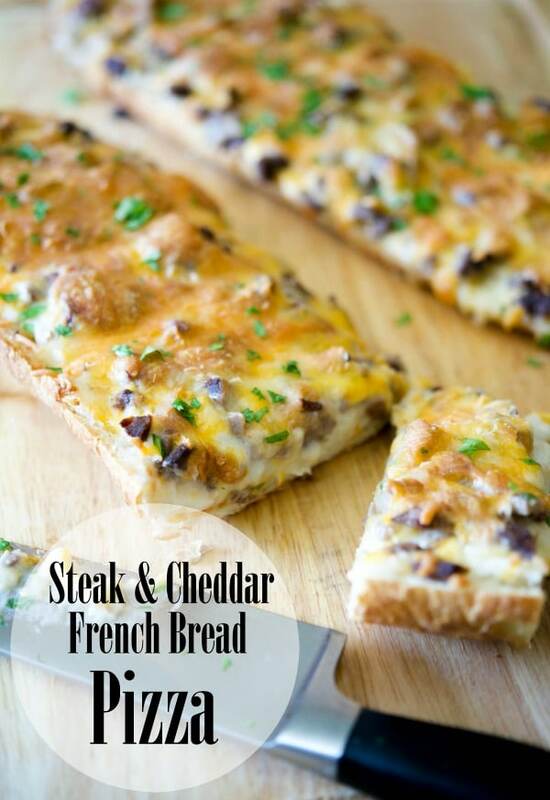 After last weeks post for 15 Grilled Steak recipes, I thought it only fitting to share this recipe for Steak & Cheddar French Bread Pizza. How many times do you have leftover steak after grilling over the weekend? We usually do; though its generally not enough for a complete meal so I tend to just add the beef on top of a salad, utilize it in soup or make a pot pie. This time I wanted to try something different and since I haven’t shared a pizza recipe since February; pizza it is! 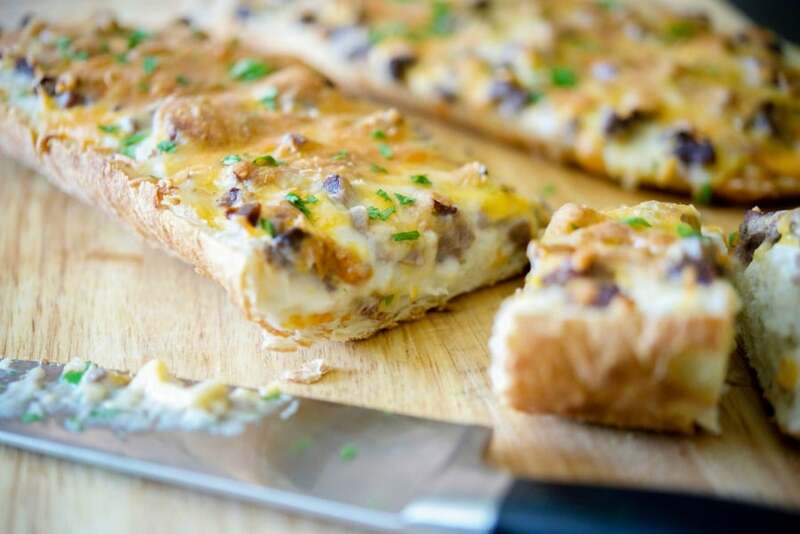 When I was a kid, one of my favorite dinners was French bread pizzas; though we generally bought the frozen kind and rarely made it from scratch. 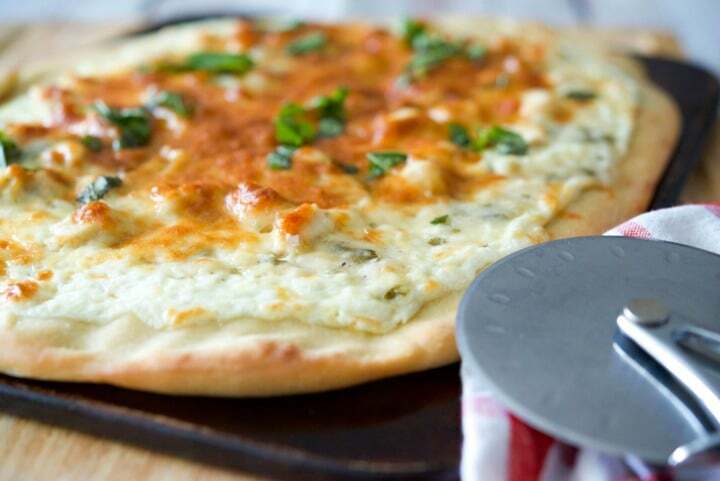 It was quick, easy and how can you go wrong with pizza of any kind; especially when you’re 10! 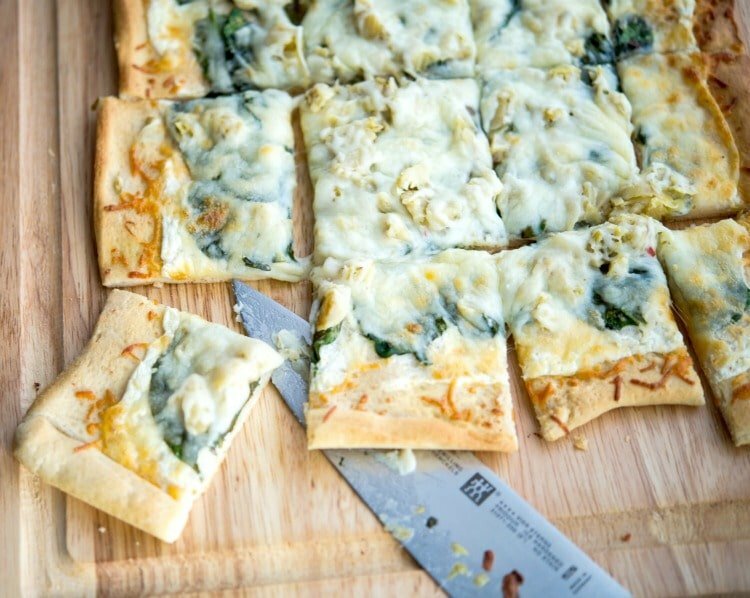 Remembering back to my youth and how much I used to enjoy them, I thought it was kind of funny that I’ve only made French bread pizza for my own family once. In fact, if I remember correctly, besides that one time, I don’t think I’ve had pizza this way since I was able to drive at 17. If I felt like pizza, I just hopped into my car, drove to the nearest pizzeria (where I also happened to work) and got my own slice. Anyway, back to this Steak & Cheddar French Bread Pizza. Like I said, I had leftover grilled steak and wanted to make a pizza, but thought that just steak and cheese on bread would be a little dry. So I decided to make a simple cream sauce and added some prepared horseradish to give it a little flavor. Beef and horseradish are one of my favorite flavor combinations. I’ve used it on prime rib, panini’s, and roast beef; each time it was fantastic so of course it should taste great on pizza right? 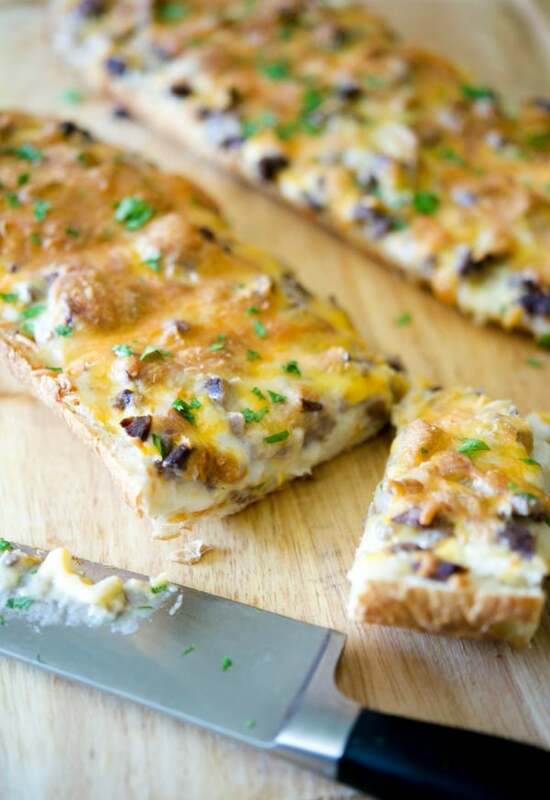 To make this recipe you’ll need leftover diced grilled steak (any kind will do, but I used rib eye), shredded Cheddar or Cheddar Jack cheese, prepared horseradish, butter, flour, milk and of course a loaf of crusty bread (French, Ciabatta, Italian..any bread will do). Start by melting the butter in a small saucepan; then whisk in the flour forming a roux. Stir in the milk and horseradish and cook for a few minutes (whisking constantly) until the sauce thickens. 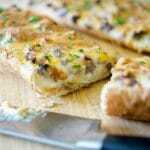 Cut the bread in half lengthwise and place on a sheet pan; then top the bread on each side with the sauce. Spread the diced steak on top of each side; then sprinkle with the cheese and bake in a 425°F oven for about 20 minutes until the cheese has melted. 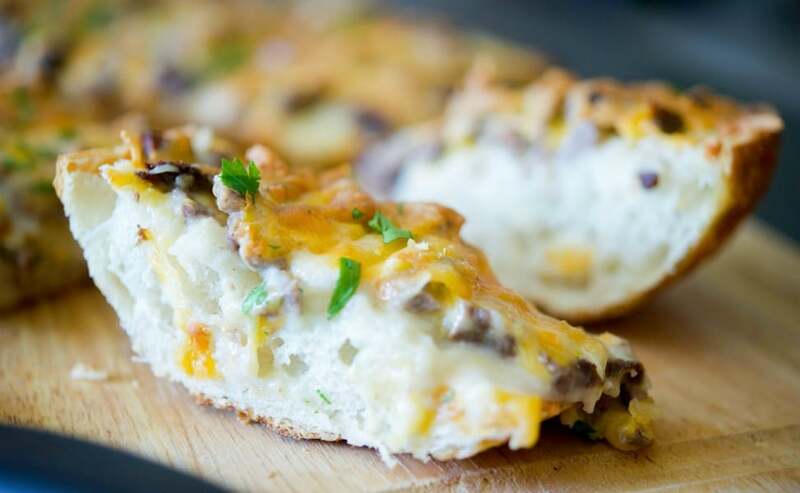 My family devoured this Steak & Cheddar French Bread Pizza. I’m not kidding. We didn’t even get to formally sit down and eat this pizza. They just kept cutting pieces off of it as they walked by; then the next day, decided to reheat it as an afternoon snack. This past weekend my husband wanted a brisket and we have quite a bit leftover. 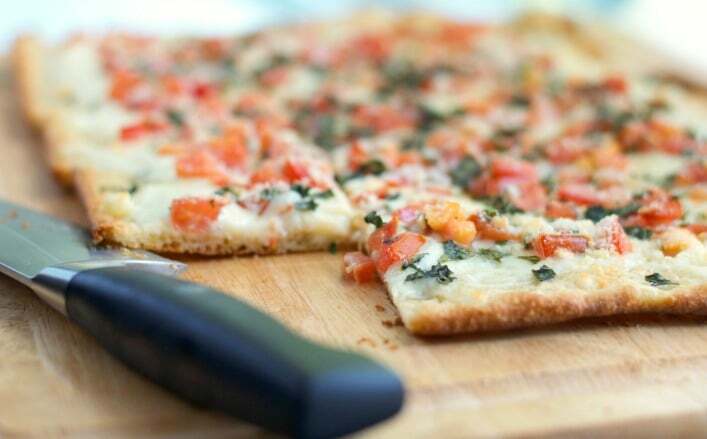 Looks like they’ll get to eat another one of these French bread pizzas sooner rather than later! ~Enjoy! Melt the butter in a small saucepan; then whisk in the flour to form a roux. Stir in the milk and horseradish and cook for a few minutes (whisking constantly) until the sauce thickens. This post includes links to my affiliate account at Amazon.com. Carrie’s Experimental Kitchen earns a few cents on the dollar when readers like yourself purchase the items I recommend. Thank you for supporting Carrie’s Experimental Kitchen when you shop at Amazon! Holy yuuuum. 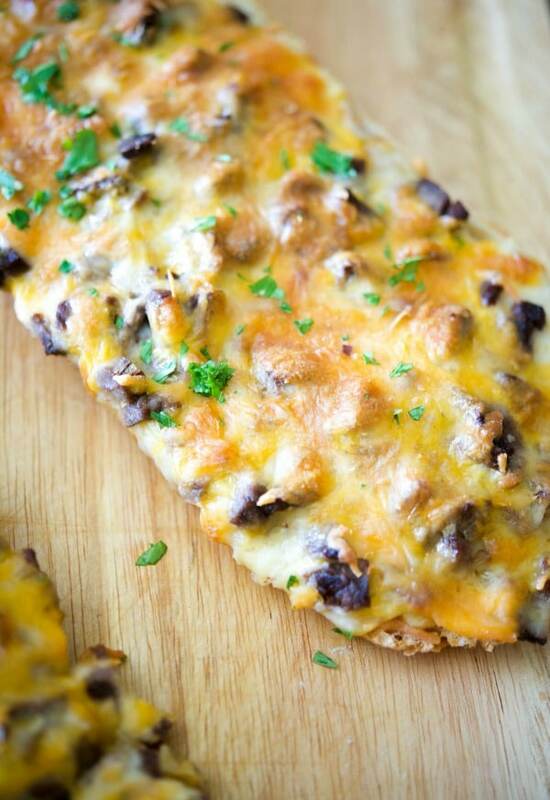 This looks SO good, and totally a shoe-in favorite with my steak, cheese and pizza lovin’ fam. Definitely need to try this soon!